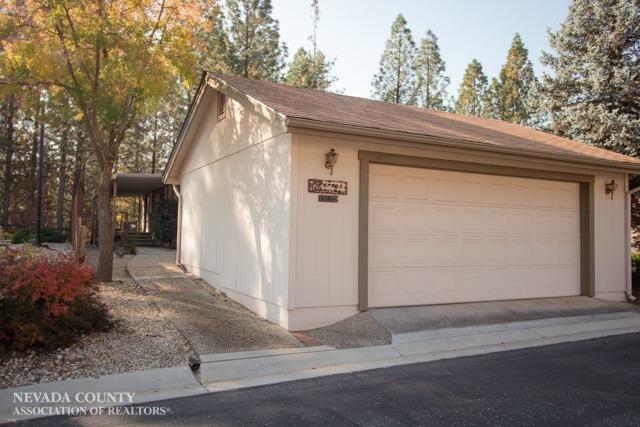 Welcome to Ponderosa Pines, a resident owned manufactured community located just minutes from historic Downtown Grass Valley. This home has a two car garage, and parking for visitors is conveniently located next door. Look out off the back deck over a forested open space with walking trails and a pond with fountain. Inside you will find a spacious living area and a nice functional kitchen. The large master boasts double sinks, shower, and large tub underneath a skylight. There are numerous amenities available to you here including a clubhouse, swimming pool with spa, putting green, shuffleboard, barbecue area, horseshoes, billiards room and library. Come see why this community is so loved by it's residents.